Yeah, adventuring? Not going so well. 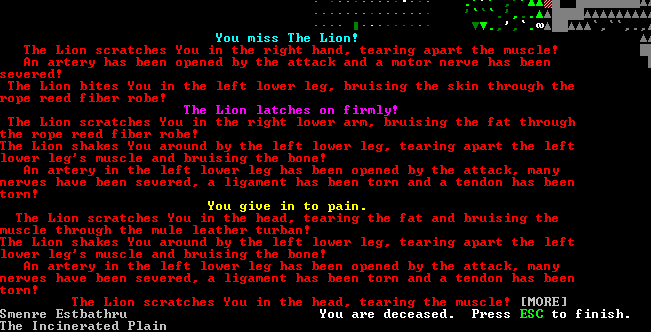 I decided I wanted to try out the ‘adventurer mode’ in Dwarf Fortress. This is about 5 minutes into it. Granted, I didn’t really look at the manual much but just gave it a whirl, but man, that was some detailed and long dying. Anyway, I’ve been digging roguelikes quite a bit lately, so if that is remotely interesting to you, check out Brogue or Dungeon Crawl Stone Soup. This entry was posted in Vergnügen and tagged Dwarf Fortress by Magickal Bunny. Bookmark the permalink.